We have been the birthday party experts in the region for over 40 years. Now, we’ve made it even easier. No… really, it couldn’t be easier. Just pick a Moonwalk. Then, choose a classic concession, 30 pre-made cotton candy tubs, or a Pucker Powder Kit to make 30 servings. 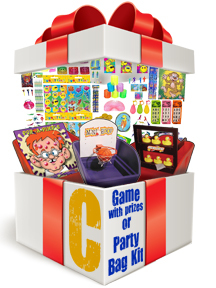 Finally, you get one of our great carnival games with $60 in prizes or a party bag kit with supplies to make 30 party bags… all for one low price! …or make it a Combo Unit instead of a Moonwalk for only $100 more! We have dozens of moonwalks and combos to choose from. Look through the BIG list and see what would match your party the best. Choose a couple, as we book up fast, so that when you call your entertainment specialist, we can check the date of your event and see what we have available. It’s first come, first served… so call right away! Then, you pick a concession item with supplies to make 30 servings. 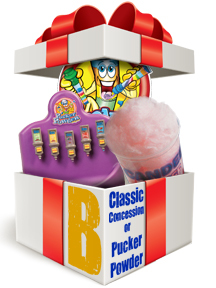 You can get a classic concession, like sno-cones or popcorn, 30 pre-made cotton candy tubs, or a pucker powder party kit. Now, you’ll have a yummy treat for the kids when they take a break from bouncing around. We know that the best parties are the ones with options… and stuff kids get to take home. So, we help with that too. 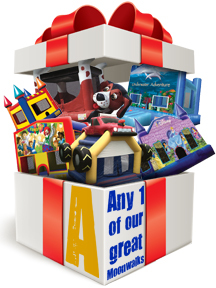 We will provide you with one of our classic or modern carnival games, along with $60 in prizes from our huge selection toys and trinkets. Or… we can give you 30 party bags and the prizes to go in them, so you can either let the kids make their own “take home” bags (as a fun activity) or make them for the kids as a great souvenir from the event. Call today to set up your “Easy as A-B-C” party with Fun Services!